Steven Alan Bush, longtime Millersport resident, is the founder and head pastor of Millersport Covenant Church. Steve attended church regularly from childhood with the love, prayers, and encouragement of his believing parents, James and Eleanor Slocumb. At the age of 12 Steve dedicated his life to the Lord’s service while attending summer camp at Camp Otterbein near Logan, Ohio. As a young boy and through high school years, Steve showed an inclination toward leadership, frequently taking charge of anything from the neighborhood football team to the school’s journalism club. In every activity, Steve demonstrated his deep love for the Lord frequently mixed with a witty sense of humor. After high school Steve attended Otterbein University and Ohio State University while working part-time or full time to pay for his schooling. He met and married his wife, Janet, in Lexington, Kentucky where he lived for several years, working in the manufacturing industry as a production foreman. During his time in Lexington, Steve felt a stirring to move back home to central Ohio where he would eventually plant a church in his home town of Millersport. The first meeting of Covenant Church took place in Steve’s and Janet’s living room on July 5, 1987. For 12 years, Steve worked full-time at Licco, Inc. in Heath, Ohio as Operations Manager while simultaneously pastoring the growing flock. During this time he was able to complete his BA in Business & Organizational Communications at Otterbein College. Steve was officially ordained as a Minister in 1991, and was able to move to a full-time pastor’s role in 2000. In addition to preaching and teaching, Steve actively and compassionately supports, through visitation and prayer, church members and local residents during times of illness and loss. 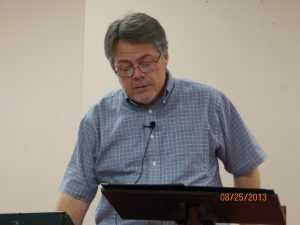 He has been invited to speak at numerous local events, and is looked to by many who claim no particular church allegiance as their local pastor. Steve uses his skills in communication and computer technology to send frequent prayer and event updates to a growing number of local and translocal residents. Steve and Janet are the proud parents of Nicole Marie Bush who recently graduated from Mount Vernon Nazarene University. Janet, in addition to her role as pastor’s wife and loving mother, is the librarian at Millersport Elementary School. Mark Thogmartin, and his wife Donna have been with Millersport Covenant Church since its inception in July, 1987. During this time, Mark has served the church as worship leader, treasurer, and associate pastor. Mark dedicated his life to the Lord’s service in the spring of 1973, and since then his relationship God has taken the primary place in his life. Professionally Mark has served as a classroom teacher, reading and math tutor, technology coordinator, and principal during his 30+ years as an educator in private, public, and charter schools. He has a bachelor’s degree in elementary education from the University of Kentucky, a master’s degree in reading from the Ohio State University, and a Ph.D. from Andrews University in Leadership. Mark’s book, Teach a Child to Read with Children’s Books, has gained wide acceptance among reading tutors and parents who are teaching their children at home. He also has written articles for several magazines and journals on the topics of home schooling and reading instruction. Mark recently retired as a founding administrator of the Ohio Virtual Academy charter eSchool. In addition to his role at Covenant Church, he currently works part-time as a mentor of doctoral students at Capella University. Mark and Donna live in Millersport and are the parents of three adult sons. Ryan, his wife Khali, and their daughters Kihryn and Kwynce live in Zanesville. Jeffrey makes his home (on a boat!) in Charleston, South Carolina. Philip and his wife Sarah live in Millersport. Mark maintains a blog, Brighter Day, where he reflects on topics related to worship and life as a believer.